AMMONNEWS - Iranian officials occasionally boast about their meddling in the affairs of neighboring countries, but the most recent example of this was seen when the deputy commander of the Revolutionary Guard Corp, Brigadier General Hussein Salami, described the interference as an art practiced by the Islamic Republic in the region. Iranian students’ News Agency (ISNA) reported Salami's statement during an event on Basij Day at Fardusi University in Mashhad city, northeast of Iran. 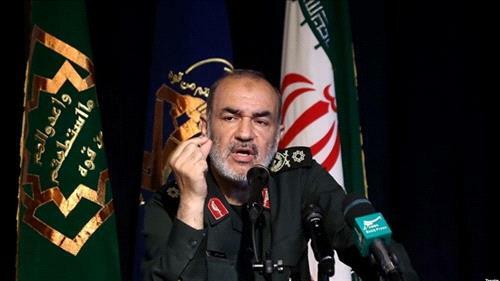 General Salami said his country succeeded in taking the battle with the “enemy” to far distances, describing Iraq, Lebanon and Syria as the frontlines of Iran’s war with its “enemies,” according to his statement. The elite Quds Force unit, the military arm of the Revolutionary Guards, has openly allied with militias and provided them with weapons in Syria, Lebanon, Yemen and Iraq in recent years. Salami said that as time progresses, “our revolution” has grown and "enemy" frontlines have widened. The Iranian general said Iran lacked an organized force and that "the art of the revolution lies in its strength to engage the enemy in large areas," in reference to Iranian military intervention in other countries, referring indirectly to Lebanon's Hezbollah and claiming that Hezbollah could shift the balance of power in the Middle East and become a deterrent element for Iran’s interests and by that, "Israel’s hopes will diminish." Salami boasted about the militias his country created in Syria, noting that Israel sees the manifestations of this force when it hears the various languages of Urdu, Afghani, Indian, Yemeni and Farsi, and that Israel feels the existence of what he described as “the International Islamic Force” near its borders, adding that America and Europe are powerless in the face of this force.